The 1944 baseball season was the peak -- or, to look at it another way, the nadir -- of wartime baseball. The National League didn't embarrass itself; the Cardinals won their third straight pennant behind respectable ballplayers like Marty Marion, Walker Cooper, Johnny Hopp, and especially Stan Musial. But in the American League, the acute shortage of players dragged the entire league down to the level of the St. Louis Browns, perennial doormats who had finished in the second division nine out of the previous ten seasons. The dismal Browns had never won a pennant in 43 years of American League competition. The 1944 Browns were relatively untouched by the military draft, as they featured an all-4F infield, nine players on the roster 34 years old or older, and a motley collection of notorious characters, such as Tex Shirley and Mike Kreevich. Fourth starter Sig Jakucki, who went 13-9 with a 3.55 ERA, had retired in 1936 with a 0-3 major league record; he was rediscovered pitching for a Houston industrial-league team. Rounding out the staff were old men Nels Potter (who went 19-7 with a 2.83 ERA) and Denny Galehouse (9-10), and youngsters Jack Kramer (who finished 17-13 with a 2.49 ERA) and Bob Muncrief (13-8). The big hitters for the Browns were 23-year-old shortstop Vern Stephens, who hit .293 and was second in homers with 20 and first in RBI with 109, and Kreevich, the team's only .300 hitter at .301. St. Louis won its first nine games of the season, and continued to surprise the baseball world by hanging tough in a four-team race with Detroit, Boston, and the Yankees. The race came down to the final week, when the Browns defeated New York five times, winning the pennant by 1 game over Detroit. St. Louis clinched the flag with a come-from-behind 5-2 victory over New York on two home runs by Chet Laabs and one by Stephens. The Browns finished with a record of 89-65, which was, at the time, the worst record ever by an American League pennant-winner. The sportswriters couldn't bring themselves to name one of the Browns American League MVP, so the award went to Detroit lefthander Hal Newhouser, who had a record of 29-9. Newhouser and teammate Dizzy Trout were first and second in both wins and ERA. Cleveland's Lou Boudreau took the batting title at .327, and New York's Nick Etten led in homers with 22. The Cards slipped from first for just four days during the season. Their 105 triumphs made them the first National League team to win over 100 games for three straight years. The National League MVP went to Cardinals shortstop Marty Marion. Musial hit .347 (second only to Brooklyn's Dixie Walker at .357) with 51 doubles, 112 runs, and 94 RBI Leadoff man Johnny Hopp hit .336, stole 15 bases, and scored 106 runs. MVP runner-up Swish Nicholson of the Cubs had another big power-hitting year, leading the league with 33 homers and 122 RBI. The Reds' wartime search for talent reached an extreme when they used 15-year-old pitcher Joe Nuxhall in one game. He returned to high school with a major league ERA of 45.00. The surprising Browns put up a good fight in the 1944 World Series -- especially by the pitchers -- but were undone by poor defense. The St. Louis double-play combo of Don Gutteridge and Stephens made three errors apiece, as their team lost the Series in six. 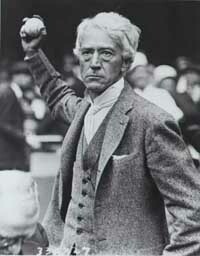 A month after the 1944 World Series, 78-year-old commissioner Kenesaw Mountain Landis died. His 35-year tenure was characterized by a strong and successful stand against gambling-related corruption, and surprising sympathy for the players' side in disputes with owners. The baseball owners have made sure never to give any other commissioner the power that they regretted giving to Landis. Landis was replaced by Happy Chandler. The next page provides headlines and summaries for some of the top stories of the 1944 baseball season.